"Your design team did an outstanding job creating our Pyramid Awards! I will be proud to present these to our more than deserving employees!" "We want passion for our business.. workers who can interpret and execute our mission, who want to build a career, not just take a temporary job." We offer awards & plaques for every occasion and every budget. Click on the image below to search one of our collections. To kick off the engagement program, the leadership team presented the program at a company luncheon. At the luncheon, all employees received a Glendale Goal-Setter Award. 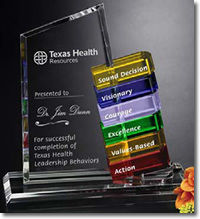 The leadership team chose this award because they needed a product that would help communicate their corporate values and also create an extended “memory” for the employees. The Glendale Goal-Setter was a perfect fit. The Glendale Goal-Setter was so different and unique; it got the attention of all employees. The beautiful elegance of crystal put a very high-perceived value on the award and communicated the importance of this program. The Goal-Setter will not be dropped in a drawer or thrown in a wastebasket because of its high-perceived value. We are confident it will remain on desks and mantels to remind each employee of our culture building program and the meaning behind it.